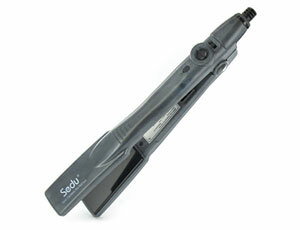 With Sedu’s thinnest plates, you can now treat the shortest styles, for normal and fine hair. Its exclusive and patented heating plates allow silky smooth results, even in humid weather! Designed with ultra-smooth plates, this product guarantees easy straightening motion, without breaking or pulling your hair. It generates 6 times more negative ions than regular straighteners. A real frizz killer! Also embedded with infra-red heat technology it seals your hair’s luster and moisture. It also features adjustable temperature control to treat all types of hair, as well as an ergonomic design to protect your scalp from burns. Its lightweight body and width allows greater control, from the roots to the edges!